Graystown Castle is spectacularly set on an outcrop of limestone rock overlooking the Clashawley River valley. Graystown guarded an important route linking north and south Tipperary along this river valley. 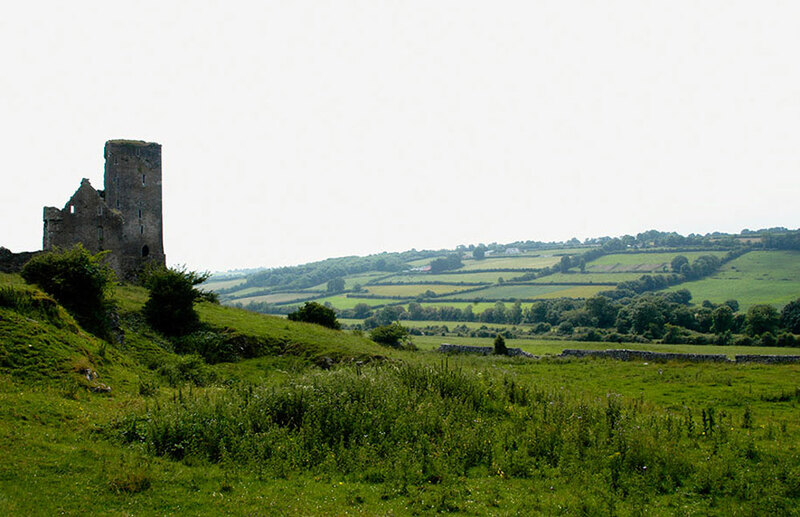 It is said that the name Graystown derives from the Norman lord and military genius Raymond le Gros, who accompanied Strongbow on his invasion of Ireland around 1170. However, it seems more likely that the area is named after one of a number of Norman knights called Grey, who are named in documents from around 1300. Henry Laffan was granted 120 acres of land here in 1305 and Graystown became the chief seat of his descendants. Thomas Laffan of Graystown was a Member of Parliament for Tipperary in 1613. The Laffans lost their lands in Tipperary following the Cromwellian conquest and were transplanted to Connaught. Their name is still evident in the nearby crossroads and derelict railway station at Laffansbridge. The castle itself dates from the 1500s, extends to five storeys and is 60 ft. high. In the 1650s it was occupied by Henry Laffan. The gable wall of a three storey mansion house also survives. This was located within the protective bawn adjoining the castle. To the north of the castle there is evidence of extensive settlement in medieval times, with the remains of up to eight houses, three enclosures and am street running through the centre. This settlement was the scene of fair days up until the 1800s. According to local tradition, Graystown contains remnants of an ecclesiastical or monastic settlement. The field to the north of the castle is known locally as the Monastery field. Please note that Graystown Castle and the surrounding fields are not accessible to the public. 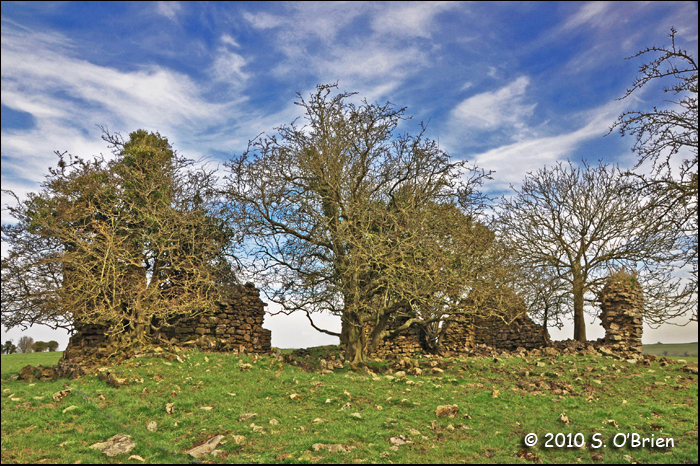 The castle ruin is situated on privately owned land. Furthermore, the site is in a hazardous state and poses a risk to anyone who enters the site. Visitors are asked not to enter into the field or castle and to only view the site from the adjacent public road. Graystown castle is sited at an altitude of 130 metres on ground sloping slightly to the south perched on the edge of a limestone outcrop. The tower house has a commanding view north-south along the Clashawley river valley on whose eastern side it is sited and would is sheltered by the hills to the east. The Clashawley River is 237 metres west downhill from the tower. There is a road adjacent to the east side of the bawn and two entrances in the bawns northern wall from paths through the settlement downhill north of the bawn. Historical: Graystown castle was the residence of the Laffan family who owned most of the parish of Graystown in the late medieval period. The site and associated structures were owned by Henry Laffan; an official of the Butler Family (Hassett and Fitzgerald 1990, 24) and is described as a good castle, a slate house wantinge repaire with a large bawne and several cabbins in the Civil Survey (Civil Survey I, 106). The tower house is depicted in the Down Survey parish map for Graystown with in a large rectangular bawn with two houses (Fig. 29). Graystown was confiscated from Marcus and Henry Laffan by the Cromwellian administration and they were transplanted to Connaught (Hassett and Fitzgerald 1990, 24). In 1659 two English men were the principle land owners in Graystown; Giles Cooke and Edward Pippen (Pender 1939,133). The Laffans failed to get their lands back after the Restoration of King Charles II. Description: Graystown castle is constructed of roughly coursed hanuner dressed limestone with large quoin stones on the corners and a base batter. The castle has four floors and is divided internally into two sections by a dividing wall. The smaller northern section rises as a tunet to form one of the gables of the tower. Graystown tower house measures externally 8.9 metres by c.17.5 metres excluding the base batter (Fig. 49, Plate 23, 24). The interior of the tower house is divided into two sections; a main section in which the largest chambers are contained and a smaller section consisting of the entrance lobby and chambers above. The walls also contain chambers and passages. A garderobe chute exits at ground floor level on the west wall over the edge of the limestone outcrop on which the tower house is sited. The south wall of the tower has collapsed, taking with it parts of the east and west walls of the upper floors. The parapet presumably had crenellations none of which survive. Corbels at parapet level on the north wall over the entrance are the remains of a machicullation. The tower house was entered through a pointed-arch door of dressed limestone in the ground floor north wall of the tower (Plate 25). The door has two orders, one of which accommodated a yett ( an iron gate). The holes for the yett can be seen in the left jamb and the apex of the arch. The door was also secured by a substantial cross bar on the inside. The aperture for the cross bar runs throughout the thickness of the wall to the left of the door. The entrance lobby was contained in the smaller internal section of the tower. There appears to have been a space or small chamber to the right as one entered the tower. This chamber is small and shallow and may be a space for a guard. It is now possible to walk Graystown tower house, bawn house and bawn from the entrance lobby into the main ground floor chamber, although originally a gun loop similar to that in Farrenrory (21) separating the two areas. The main ground floor chamber was entered through an additional lobby to the right of the entrance lobby. The original door frames have been removed. The vice or circular stairs are located off this additional lobby through another door. The ground floor main chamber was lit by three windows set in embrasures in the east west and south wall. Most of the southern embrasure was destroyed with the collapse of the south wall. The east and west embrasures have narrow slit windows of dressed limestone set in splayed ingoings. The western window is round-headed, the eastern square. The upper floors were reached by the vice in the north-east corner of the tower house. The vice is accessed through a door from the secondary lobby on the ground floor level. The stairs have been removed above the first floor level probably to restrict access to the upper floors of a potentially dangerous ruin; observations of the upper floors have to be taken from the ground floor. The first floor main chamber and secondary chamber were entered from the vice through pointed-arch doors. The first floor main chamber had a wooden floor supported on corbels and wall plates. The chamber was lit by two narrow windows set in embrasures on the east and west walls and presumably by another on the south wall. The ingoing of one side of the southern embrasure can be made out. The chamber had two opposing wall cupboards in the east and west walls. The secondary chamber was entered directly off the vice and had a wooden floor supported on the thickness of the ground floor walls and a corbel on the north wall. The chamber was lit by two narrow square-headed slit windows with splayed ingoing on the north and west walls. The second floor main chamber was entered directly from the vice through a pointed-arch door. The secondary chamber on this floor was entered from the main chamber. The main chamber had a wooden floor supported on corbels and wall plates It was lit by a narrow square-headed window in an embrasure on the east wall and another on the southern wall which has been destroyed by the collapse ofthis wall. There is also a wide fire place on the east wall. The secondary chamber was entered through a square-headed door. The chamber was wooden floored and lit by narrow square-headed windows on the east and north walls. There appears to have been a chamber in the thickness of the west wall which has been exposed by the collapse of the wall. The chamber or passage was lit by a square-headed window. This may have been a secret chamber or garderobe whose entrance from the main chamber has been destroyed. The third floor had perhaps the most complicated arrangement. The secondary chamber on the third floor was entered directly off the vice. This chamber had a wooden floor and a stone vaulted ceiling. There appears to have been two set of corbels in the walls, the upper set of which have been defaced. The entrance is at the level of the upper set of corbels which suggests the level of the floor was dropped to provide more head room. The chamber had a single wall cupboard in the south-west corner and was lit by a narrow square-headed light in the west wall. It is unclear how the third floor main chamber was accessed as there appears to be no entrance from the vice. There is a passage on the third floor supported on a vault and separated from the main chamber by a wall; this passage accessed from the vice. Another chamber in the east wall is partially exposed by collapse of the wall at this height and was connected to the vice. The chamber was lit by one window most of which has also collapsed. There is also a passage in the thickness of the west wall above the second floor mural passage. It is unclear if this connected with the other mural passage on this floor. The third floor main chamber may have been reached from the second floor main chamber or down form the fourth floor main chamber. The fourth floor main chamber was entered directly from the vice. It is unclear if the secondary chamber on this floor was entered from the main chamber because the wall is obscured by ivy. The outline of the gable is still visible on the interior north wall. The turret on the nOlth of the tower over the secondary chambers was presumably accessed from the vice. There are two doors on this tunet exiting on parapet level at either side of the gabled roof connected by an interior passage. Comment: Graystown tower house, sited on a limestone outcrop on the slopes of a river valley, is probably the most impressively sited tower house in Slieveardagh. The tower house along with the bawn walls and the mansion house would have made an impressive landmark on the settlement below. Internally the tower house has a complicated arrangement, which can be expressed in a planning diagram (Fig. IIA). The main hall was probably on the second floor with the fire place and possibly a garderobe. The secondary chambers were probably the private bed chambers. The third floor also appears to have been special with limited access and the mural chambers. The architectural style of Graystown suggests a late sixteenth century date. The tower houses size and internal anangement is a testament to the power of the Laffan family. It is unclear if Cooke or Pippen lived in the tower house after the Cromwellian confiscation of the property. The site appears to have survived until the wood was salvaged from the interior in the post medieval period, resulting in the collapse of the southern wall and the internal vault. 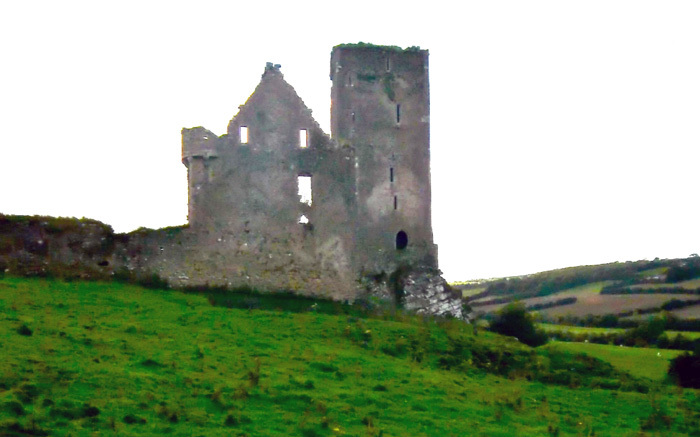 However in comparison to other tower houses in the barony Graystown is in relatively good repair. Description: Graystown Church is a free standing structure with east and north walls extant, measuring 18 metres by 7.65 metres with a ratio of width to length of 2.4:1. The church is constructed of roughly coursed and poorly pointed limestone and undressed flagstone quoins. The west wall survives to only two courses and the south appears to have fallen outward and lies as sections of overgrown mortared wall (Fig. 51). The south wall survives as several elongated stones along the original foundation line. The remaining east and west walls are in a bad state of preservation and only survive to there original height at the corners (Plate. 27). Comment: Graystown parish church architecturally dates from the late medieval period, probably the fifteenth or sixteenth century. Graystown’s width-to-Iength ratio of 2.4:1 is the same as Buolick parish church (10) (without the secondary chancel); the ogee-headed window and the southem pointed-arch entrance are also similar to Buolick. The site appears to have been in use from at least the thirteenth century and the present church probably replaced an earlier building. Graystown church is isolated from the rest of the settlement at the centre of Graystown (28), which took advantage of the more sheltered site off the exposed hill and focused on Graystown castle (26) (Fig. 52). The chancel was lit by a narrow east light and at least one window in the north wall. The chancel light has been mostly destroyed and only survives as one side of a splayed ingoing. The remains of the north window consists of a sill; the rest of the window frame and ingoings have been destroyed. A fragment of an ogee-headed window lies inside the church. 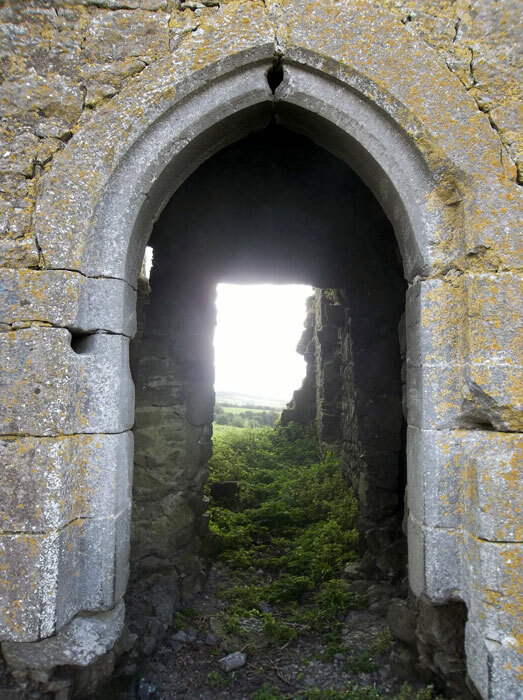 The remains of the entrance was set off-centre in the north wall and consists of a portion of the jamb of a dressed limestone door frame still in situ and fragments of a pointed-arch limestone door and jamb lying outside. A square granite lavabos lies inside the church. The lavabos was originally set in the wall inside the entrance for the congregation to bless themselves with on entering. Graystown church stood within an elongated raised enclosure or grave yard. The 6″ o. S. map shows the grave yard running north for approximately 53 metres however this only survives today as a slight bank to the east of the church. A small shale quarry between the road and the church encroaches on the south side of this enclosure, revealing a thin sod. Location: Graystown church is situated in the south of Slieveardagh, on a hill overlooking the Graystown castle and the Clashawley river valley. The church is situated 422 metres to the north-west of the castle (Fig. 52). Graystown church is sited at an altitude of 175 metres on the crest of a hill. The church site is adjacent to a small road. Historical: The church of Graystown was called Scoman in the medieval documents. In 1302-07 Scoman church was valued at £4 13 shillings (Cal. state papers 1302-07, 285). In 1437 Scoman was included in a list of Procurations (Seymour 1908, 331). In 1607 Scoman was included in a number of churches whose livings were held by the Archbishop of Cashel and Emly personally without an obligation on his part to provide services for the church (Cal. state papers 1606-08, 241). Scoman had no service or masses in 1615 and was a parcel of the vicarage of precentoris, although the vicar is not named (Murphy 1912, 290, 302). In 1640 the tithes of Graystown church were held by the vicar of the church and amounted to £15 (Civil Survey I, 105). The church did not have glebe land. Graystown church was depicted in the mid-seventeenth century Down Survey map (Fig. 29). Location: Graystown is situated in the southern section of Slieveardagh on the east side of a Clashawley river valley which dissects the hills from north to south (Fig. 3B, 26). Graystown is 3 km west of Killenau1e (37) and 11km north of Fethard. Graystown is sited at an altitude of 130 metres, in a sheltered position within the Clashawley river valley. A small road ran north-south along the natural route of the Clashawley River Valley. The main road through Slieveardagh is situated to the north of Graystown and another road runs from Graystown over the hills towards Killenaule (37). 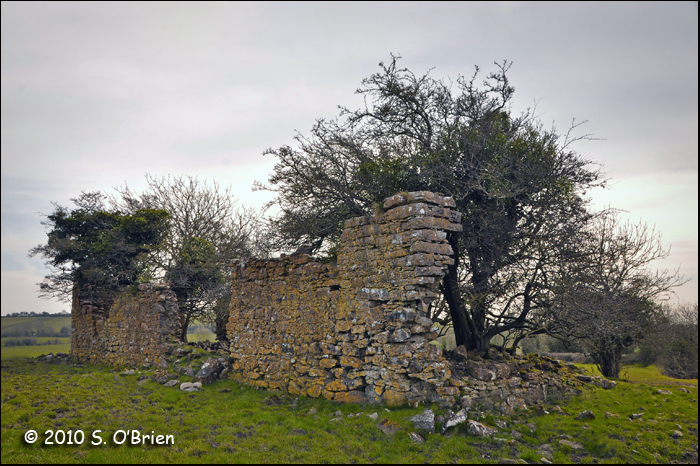 Historical: Graystown parish centre contained the residence of the Laffan family, who owned most of the parish of Graystown in the late medieval period. The Laffan family had been associated with Graystown from the fourteenth century when their main residence appears to have been in the adjacent parish of Mogarban. In the sixteenth century the Laffans were referred to as Lords of Ballingrey or Graystown. In 1640 Henry Laffan owned Graystown and the settlement was described as a good castle, a slate house wantinge repaire with a large bawne and several cabbins (Civil Survey I, 106). The Down Survey parish map depicts Graystown with a castle (26), large rectangular bawn with two free standing internal houses, three cabins to the north of these and the church of Graystown (27) is depicted to the south-east of the castle (Fig. 29). Graystown was confiscated from Marcus and Henry Laffan by the Cromwellian administration and they were transplanted to Connaught ( Hassett and Fitzgerald 1990, 24). In 1659 two English men were the principle land owners in Graystown; Giles Cooke and Edward Pippen (Pender 1939, 133). The Laffans failed to get their lands back after the Restoration. In 1659 Graystown had an adult population of 73 (Pender 1939, 296); in 1666/7 the townland had 26 single hearts (Laffan 1911, 134). Description: Graystown settlement remains consist of the sixteenth century tower house with its bawn house and enclosing bawn wall (26), a sixteenth century church (27) and earthwork remains of houses in two fields to the north of the tower house (Fig. 52; Plate 26). Graystown tower house and bawn are impressively sited on the edge of an outcrop of limestone. A large bawn house was built in the late sixteenth or early seventeenth century and the whole complex overshadowed the rest of the settlement to the north. Graystown Church (27) is sited 422 metres north-west of the rest of the site, in an exposed position on the crest of a hill (Fig. 57). The church also appears to be a late medieval construction. The rectangular earthworks which survive around Graystown (28) appear to be the remains of the houses depicted to the north of the tower house in the Down Survey (Fig. 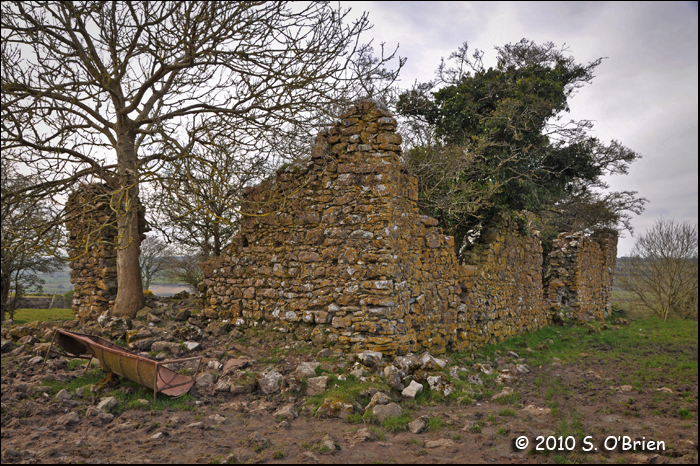 29; 52) The remains of eight houses (a-h), three within enclosures (a, d & g) are located in the two fields to the north of Graystown tower house and bawn (26). The remains consist of six sub-rectangular hollow or platforms, one (g) with substantial stone remains. House (c) measures approximately 18 metres by 7 metres, house (b) 10 metres by 5 metres. Both have the remains of stone footings for walls. Two sub rectangular depressions (a) and (e) measure 11 metres by 5 metres and 19 metres by 5 metres respectively. House (f) consists of an earthen platform with banks measuring 10 metres by 17 metres. House (h) consists of earthen banks in an open ended rectangle measuring 7 metres by 6 metres. The subrectangular enclosures of houses (a) and (d) measure approximately 40 metres by 20 metres and 12 metres by 16 metres respectively and were probably crofts or gardens for houses. House (g) has substantial stone remains. The house remains consist of a raised area built up above the level of the rest of the field, with stone rubble and measuring approximately 6 metres by 9 metres and a sub-rectangular annexed platform with a hollow centre and the remains of stone walls, measuring approximately 10 metres by 7 metres. The remains of house (g) is attached to a substantial stone walled square enclosure measuring 38 metres by 34 metres. This enclosure is large enough’to have acted in a similar fashion to a bawn wall. The substantial remains of house (g) were not mentioned in the Civil Survey and may have been built after the mid-seventeenth century. The field in which it and the other earthworks are sited is known locally as the monastery. Other linear earthworks in the field are probably the remains of small fields or haggards associated with the houses of the settlement. Comment: The settlement at Graystown has perhaps the best preserved physical evidence of the cabins mentioned in the mid-seventeenth century sources. There preservation is probably a consequence of the numerous rock outcrops in the field which make it unsuitable for tillage or machinery, otherwise the field would have been cleared of its earthworks. The ruins of the tower house and bawn house (26) over-shadow the site and must have dominated the settlement in the later medieval period. The cabins appear to have faced onto the path running up hill towards the bawn. The church (27) is removed some distance from the settlement, in an exposed prominent site. The church, known in the historical record as Scoman, was used as a church site from at least the initial Anglo Norman invasion. Its siting represents the continuity and conservatism of church siting. Even though the church of Graystown appears to have been renovated in the later medieval period, using similar architectural motifs to the tower house, the church remained in relatively isolated position from the rest of the settlement, probably serving a wider, dispersed community. The form of the settlement at Graystown was dominated by the tower house and was probably populated by the tenants of the estate. There is no evidence to suggest that the settlement developed multi-functional services or ever progressed beyond a harolet dependent on the tower house. The settlement probably died after the tower house complex was abandoned.